Sammath Naur Pt. 6: Gollum’s Fall, plus [long] essay. Warnings: Again, my apologies to dial-up viewers for the many images. [Sam] groped forward, and then he saw a strange and terrible thing. 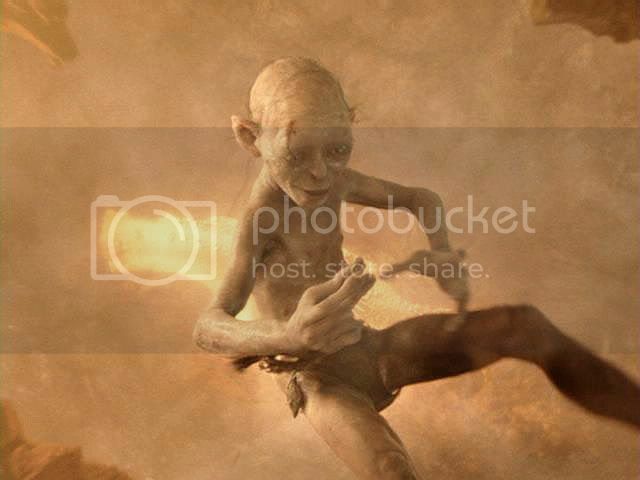 Gollum on the edge of the abyss was fighting like a mad thing with an unseen foe. To and fro he swayed, now so near the brink that almost he tumbled in, now dragging back, falling to the ground, rising, and falling again. 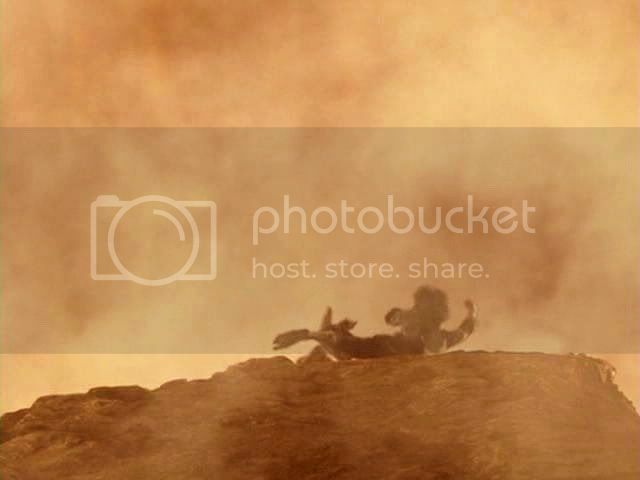 I suppose the film-makers felt they couldn't really do justice to the book fight with an invisible Frodo, so they saved it for when he was visible again—minus the end of his finger, but not his fury. It's a wonderfully choreographed film fight, all the more striking from a distance. 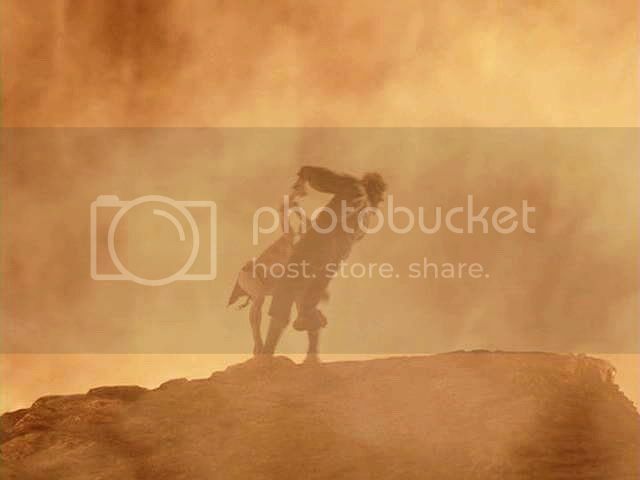 The two figures are stark against the golden glow of the background, yet the swirling mists and vapours soften the scene at the same time, giving their desperate struggle an otherworldly look, almost dream-like. 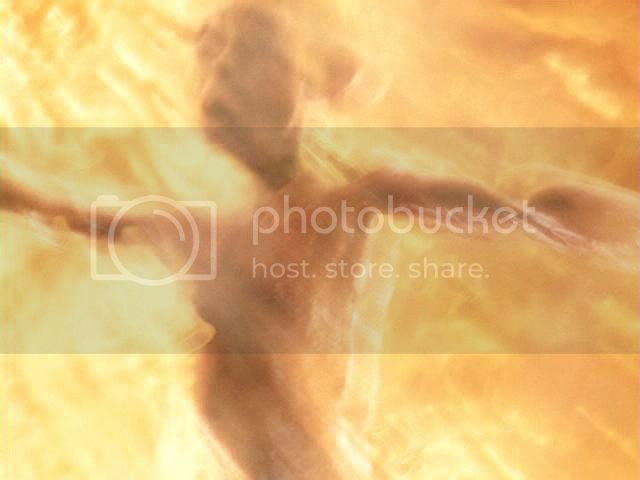 Re-visiting this scene in order to make a fullscreen image of Gollum falling into the fiery abyss, I found the whole sequence so visually and emotionally arresting I decided to make an abbreviated set to post here. Gollum's fall as seen in the film is a long one; seen in screencaps, it seems to take an eternity. Watching him descend both expands and concentrates the impact of his fall, letting the viewer watch each frame as separate moments, frozen in time, each frame recording a gradation in Gollum’s transition from euphoria to bewilderment to horror to sorrow and dismay at the loss of the treasure he had finally regained. 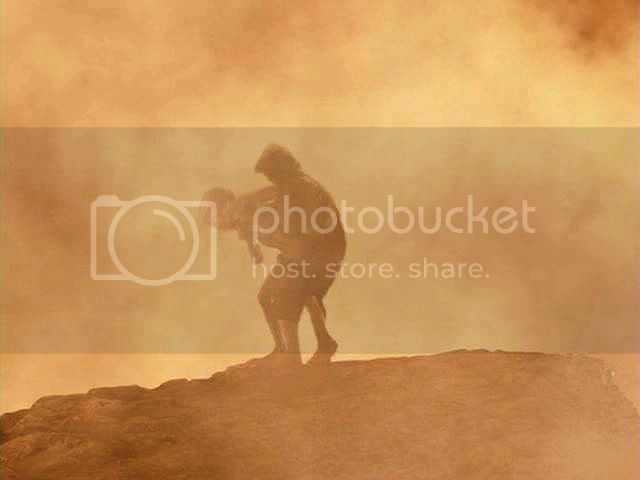 He does not seem even to feel what must be an excruciating death, sinking into molten lava, only the loss of the Ring. 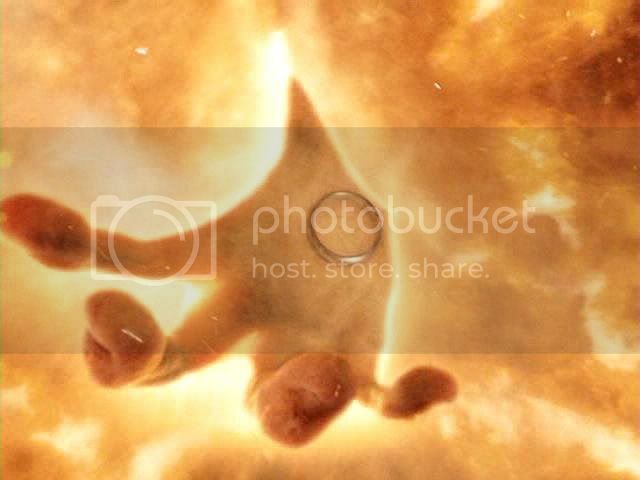 It is as if he is already being consumed before the flames ever touch him, the Ring already burning him up from inside. Why should he notice the fire outside? 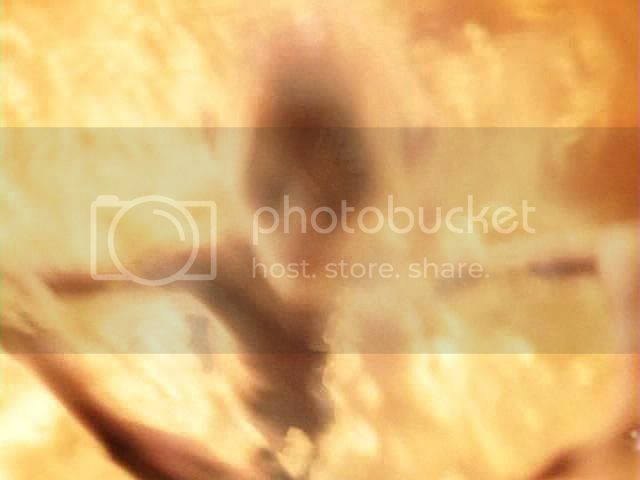 The out-of-focus frames toward the bottom showing Gollum first entering the lava are brilliant, I think. 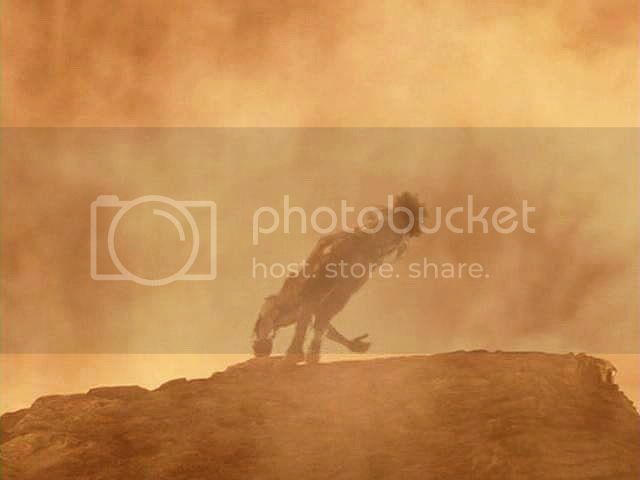 They are very intense, but the out-of-focus quality, perhaps, gives them a surreal look. Looking at them is like looking through a window at Gollum in hell. 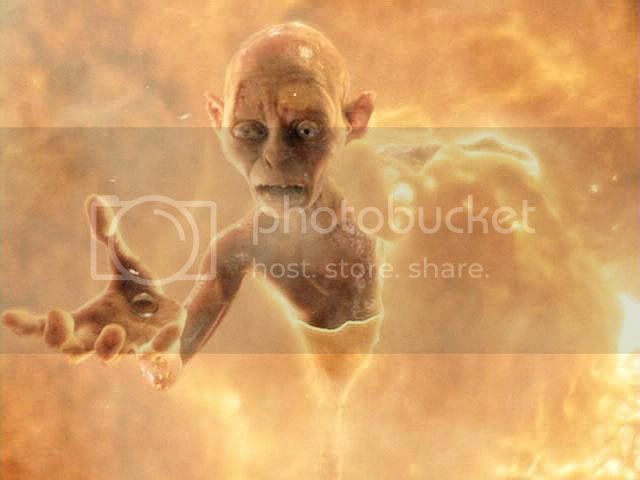 It was from this fate that Frodo was saved, Gollum effectively taking his place in the inferno. That Frodo had a sense of this—in the book—is made clear by what he says to Sam about forgiving Gollum, after the Ring is destroyed. Frodo knows what he (and Middle-earth) owes to Gollum's misstep, even if Gollum had not intended to bring this boon. The world, and Frodo, lives. 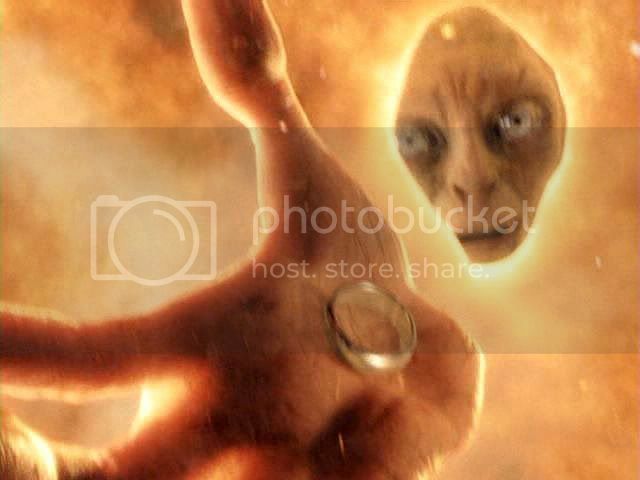 After his initial euphoria passes, Frodo will still have to struggle with the continuing desire for the Ring, and feelings of shame for still desiring it, but his lot will not be Gollum's. 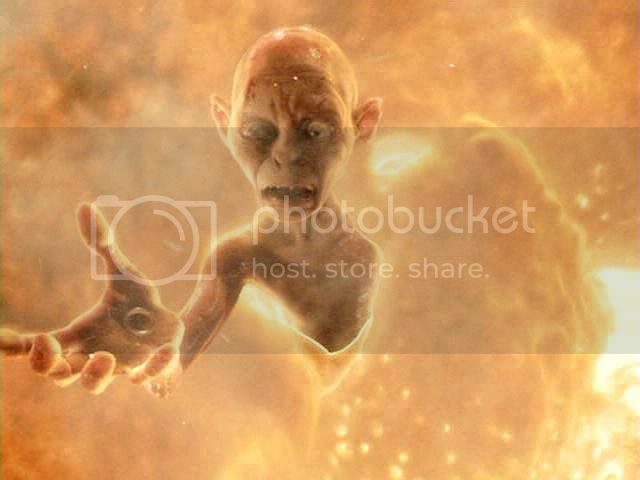 When I look at Gollum's face in this sequence I can’t help feeling pity for him, even love. Wicked as he has been, he is pitiful, so utterly overwhelmed and outmatched by a power far greater than he. In this doomed contest, his end is a terrible one. 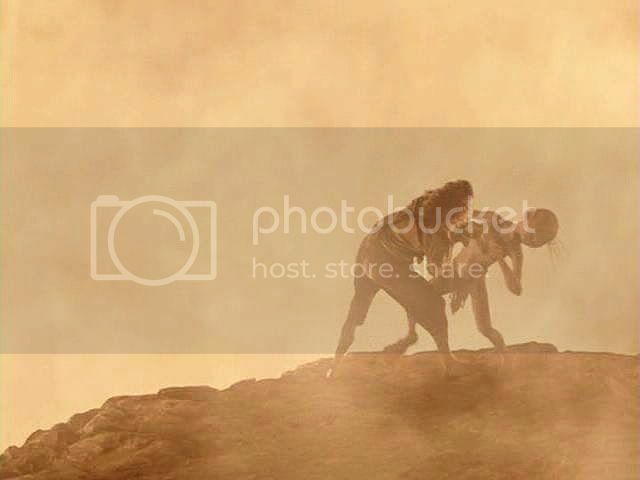 Following the screencaps there is a rather extended essay concerning why I think Gollum fell. In it I talk about the importance of Gollum’s oath, and the power words can have in Tolkien’s narrative world. I have also posted book texts bearing on Gollum's oath below the essay. I. Long Essay on the power of words in Tolkien, especially as they pertain to Gollum's oath. In Tolkien’s secondary world, not just the one depicted in LotR, the power of words is very great, for good and for ill. For good, there’s the song of the Ainur, of course, through which they sing Arda into being. It is not clear to me if their song had actual words. I tend to think not, picturing the Ainur communicating in some way more like the Ring-bearers' "mind-speech". Perhaps the Ainur “mind-sang” the world into being, with a music that is music, yet transcends it, using words that are words, yet which transcend what one thinks of as words. When Morgoth brings about the death of the Two Trees and Valinor is darkened, Yavanna, sorrowing, “sings” over them until, at last, they bear the fruits that will become the Moon and Sun. In LotR, in the world the Ainur’s song created, Middle-earth, speech—both spoken and sung—also has creative, restoring power. Goldberry’s song restores and refreshes Frodo’s spirit. Tom Bombadil’s songs subdue Old Man Willow and the Barrow Wight, not only when Tom sings them, but when Frodo does. Singing the words Tom has taught him and his friends before they set out, he sings in a small desperate voice at first, but his voice grows until the chamber seems to be filled with the noise of drum and trumpet. It is as if the power is in the songs themselves, rather than in the singer, a power that grows in the act of singing. Tom’s song, even sung by Frodo, breaks the hold of the Wight's dark spell and sets the hobbits free. It sets them free literally, by summoning Tom, who comes to them and sings to banish the Wight and release the dreaming hobbits from their bonds. But Tom's song has the power to set them free from the inside, too, lifting the heart of the singer and rousing him to action. 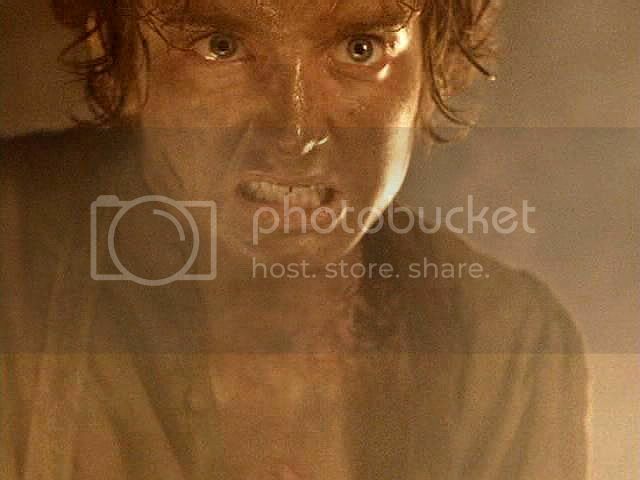 Even before Tom comes, Frodo, singing, in spite of the terror of the situation, feels his courage rise within him so that he can act. When Sam can't find Frodo in the Tower and sits on a step, feeling defeated, the song that comes to him is freeing in the same way. The tune is one of Mr. Bilbo's, but the words, it says, were Sam’s own, coming to him "unbidden". His first tentative murmurings grow to an echoing sound. The dark-defying, stirring verses of "In Western Lands" don't summon Tom Bombadil to his rescue, but they bring “new strength” to Sam’s heart and limbs. 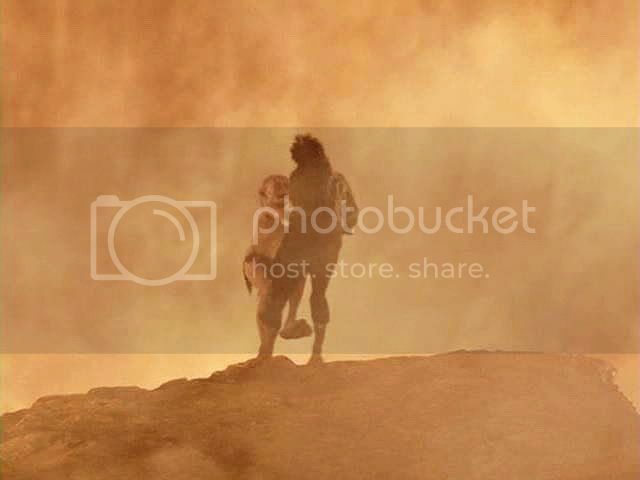 And Frodo, in the upper chamber, hears the song and sings back to him, which is how Sam finds him. Thus Sam's and Frodo's hearts are "freed", in a sense—freed from the despair that makes it impossible to act. In the First Age, Lúthien goes to look for Beren, imprisoned in Angband under Thangorodrim. Desperate to find him in Morgoth’s dungeons, she sings. Beren hears her song, his spirits lift, and he sings back to her. Lúthien comes to him and releases him, and, together, they escape. When Fëanor’s son, Maedhros is captured by Morgoth and left to hang by his wrist from the sheer side of Thangorodrim (also in the First Age), Fingon enters Morgoth’s domain to look for him. Fingon nearly despairs in his search, but, in defiance of the Orcs hiding all around him, he sings a song of Valinor, “that the Noldor made of old,” in the time before Fëanor’s oath brought strife between the Eldar. Maedhros hears and sings back. Thus Fingon is able to find him and Maedhros is rescued. Words which are not sung also carry great power in Tolkien's world. These are oaths and curses. Yet, like the song Frodo sang in the barrow, which had a power apart from him, the words of oaths and curses also have a power of their own. 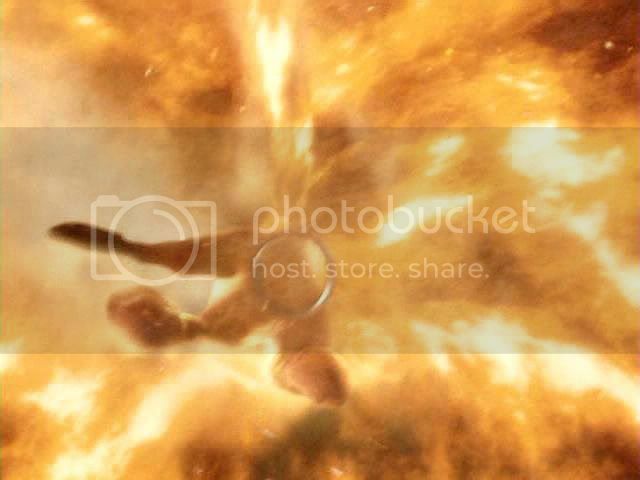 When Fëanor pronounces his curse, rejecting the Valar, and vowing to reclaim the Silmarils from Morgoth no matter the cost, his sons and many of his kin join him in his rash oath. The Valar are stunned and horrified. Hot-spirited Fëanor might not realise the power such words can hold, but the Valar do. The way Fëanor’s doom—and the doom of his fellow oath-takers—is played out, the words that he vowed are binding in a way that cannot be gainsaid, not even by Manwë or Varda. The oath has a life of its own to bind the oath-takers, to the death. When at last only two of Fëanor's sons are left, Maedhros and Maglor, they are still driven by the oath. Against their own hearts they have sacked Doriath and the Havens of Sirion, killing most of the remnant of their people and kin trying to regain the Silmaril of Beren and Lúthien. After the last battle, when the other two Silmarils have been recovered from the crown of Morgoth, Maglor tries to persuade Maedhros to relinquish their claim on the holy jewels, and to repudiate the oath by which their father bound them. They should return to Valinor and plead for mercy. But Maedhros cannot be persuaded. The oath will bind them, he says, sworn as it was to Ilúvatar. The brothers have no choice but to fulfil it. So they each steal a Silmaril, but Maglor's burns him unbearably (for only the pure-hearted can hold one), and he casts it into the Sea. He departs to "wander ever" by the waves, singing, in pain and regret. 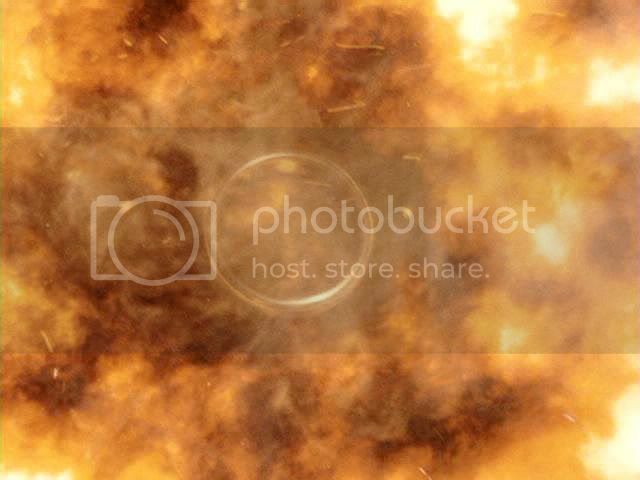 Maedhros, overcome by anguish and despair, throws himself and his Silmaril into a chasm of fire. In LotR, when the Men of the White Mountains break their oath of allegiance to Isildur, they are condemned to a twilight existance under the mountain—whether by the power of Isildur's curse or the power of their oath or both—until the time comes that they should fulfil the oath they broke. And it is with utmost seriousness that Pippin and Merry take oaths to serve their respective lords, Denethor and Théoden. "Until my lord release me, or death take me, or the world end," Pippin swears to the Steward of Gondor. The reader knows he means it not just because Pippin is true-hearted, but because of the world Pippin lives in. In the world of Middle-earth, only the craven break their oaths. The Fellowship is about to depart on perhaps the most perilous journey of the Third Age. If any group should, by sheer necessity, be bound to faithfulness by oath, it would be this one. Yet Elrond does a strange and wonderful thing. He proclaims them free of any such binding words, free to stay or to go, just as their hearts prompt them to do. My own feeling about this is that Elrond, son of Elwing and Eärendil, who knew the whole history of the oath of Fëanor and saw first-hand at the Havens of Sirion what a binding oath could cause, was loath to ever use one again, no matter how pressing the need. Yet ironically, because of his reticence to bind the members of the Fellowship by an oath, he ended up asking them to bind themselves by something far stronger: the ties of love. Jan-u-wine, proof-reading a first draft of this post, lifted up this facet of what Elrond had to say. [T]he one thing that truly resonated was your comment on the oath that the Fellowship took, a very interesting one in terms of it being different from the sorts that people in Tolkien's worlds normally were involved in: an oath involving free moral choice, choice made moment to moment in what would be known (even from the start) to be very difficult moments. It is interesting to me, in thinking on it, that this oath, seemingly more "kind" than others, was (to those of a truly moral bent) more binding than any other, by being "less" so. There are oaths that propel one forward out of fear, and there are those that propel one forward out of thought, spirit, heart. That was the oath that the Fellowship took, I deem. One that could be severed by death, for never would they choose to turn aside from it, being impelled, from the start, by the right motive: love. In any situation where one is impelled, there is the impeller (or?) and the impellee. Elrond gave no thought, apparently, to set them on this road in any other manner save the one that was fitting: he impelled through love. How different might the Quest have been had it begun with oaths sworn by means other than love and free will. Sometimes I think that such oaths, since they might not be undertaken for the right reasons, or not "held", in future, for the right reasons, are bound to fail. Only the oath taken in love, with love, it seems to me, has any chance of success. All else has the hint of the lie, the hint of *coercion* in it. And coercion has everything to do with Sauron. These people needed to be free of any but the purest "slavery" of all: the slavery of selfless love. Oath-breaking is not unknown in the real world. Tolkien was not ignorant of history. In my own culture, promise-breaking is so pervasive that it largely goes unremarked. But the taking of oaths in Tolkien’s secondary world was a grave thing with grave consequences for oath-breaking. One of the truest examples of these sad consequences is the doom which found Gollum in the Sammath Naur. Many readers have argued about why Gollum fell to his death in the Sammath Naur. Obviously, in the first place he fell because it was necessary. Someone had to destroy the Ring in order for the story to be properly resolved. It couldn’t be Frodo, since the Ring was carefully portrayed as something irresistible, to which anyone who carried it would, eventually, succumb. As a first-time reader, although I was shocked that Frodo's will was overpowered in the Sammath Naur so that he claimed the Ring, the clues were there, all along. If Gandalf and Galadriel would not take the Ring, so sure were they that they would be overpowered by It, what made me think Frodo would be able to withstand It? I suppose I just wanted him to, by virtue of his goodness and my love for him as a character. 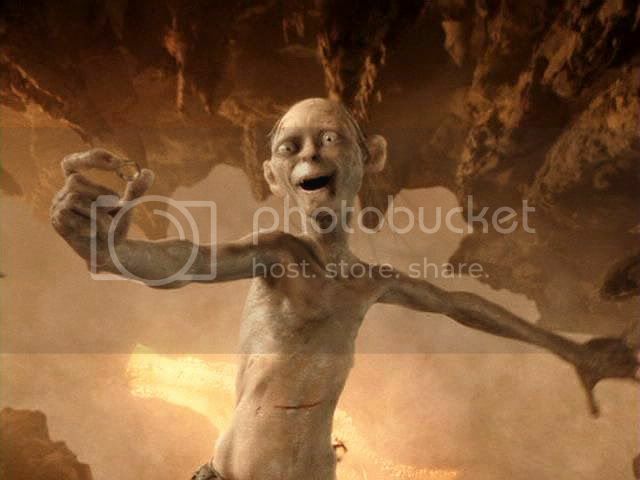 But, apart from the needs of the plot, was there no other reason Gollum had to fall, Gollum in particular? 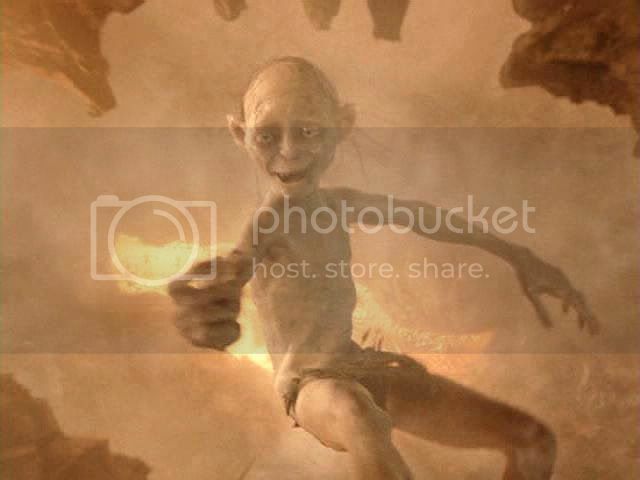 Negative critics of LotR have pointed to the unlikelihood that Gollum would “just happen” to slip on the brink of the Crack of Doom, calling it transparently convenient, as well as unlikely. 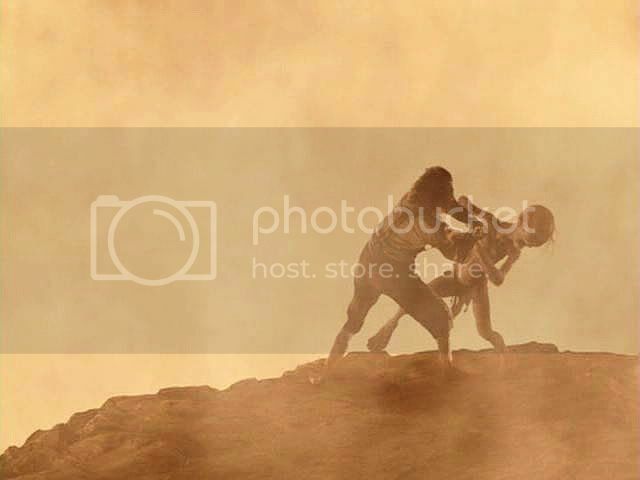 Here was a character who had spent the story prowling skillfully through every sort of terrain, even climbing down the face of precipices head-first, "like a spider". Why lose his footing in the Sammath Naur except as a thinly-disguised plot device—a means to a narrative end? Against all logic I’ve always had a gut feeling that Gollum's death satisfied some sort of internal logic to the larger story—but I could never put my finger on it. In order to prepare this series, particularly to discuss the way the film portrayed Gollum treating his oath lightly in some film scenes*, I did more background reading in the book. My answer was right there, in the text. 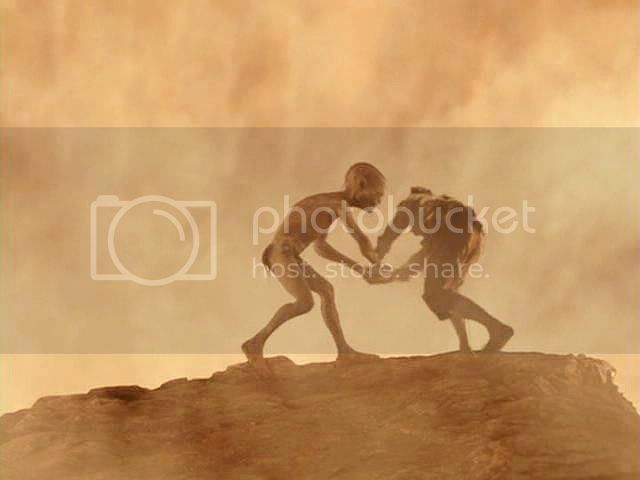 In the Dead Marshes, when Sam overhears Gollum arguing with himself, Gollum is first shown twisting the original meaning of his oath to suit his needs. He muses, if he took the Ring, then he would be the master of the Precious. 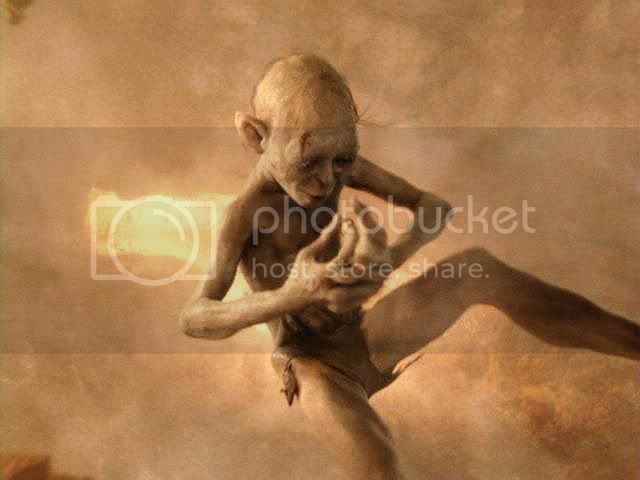 And he had promised "to serve the master of the Precious”.... Gollum has not yet reached the stage where his plans include murder, but he's getting there. At the Black Gate, when Frodo asks Gollum about his alternative plan to enter Mordor via the Morgul pass, Frodo reminds him of the binding nature of the oath, and its perilousness. 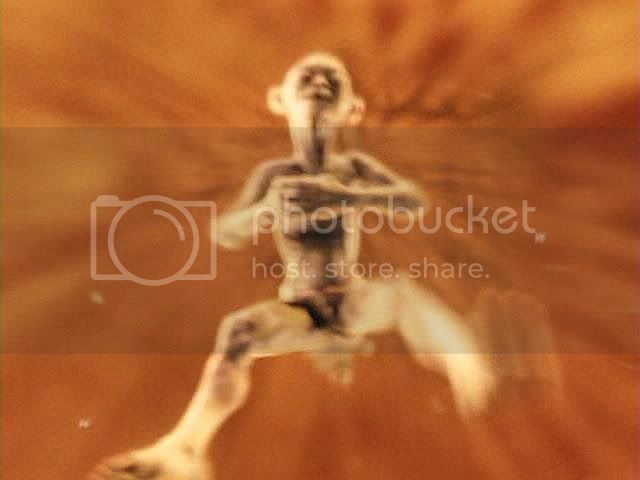 Gollum does continue to acknowldedge the gravity of the oath he’s made, as shown by his behaviour at the pool below Henneth Annun. 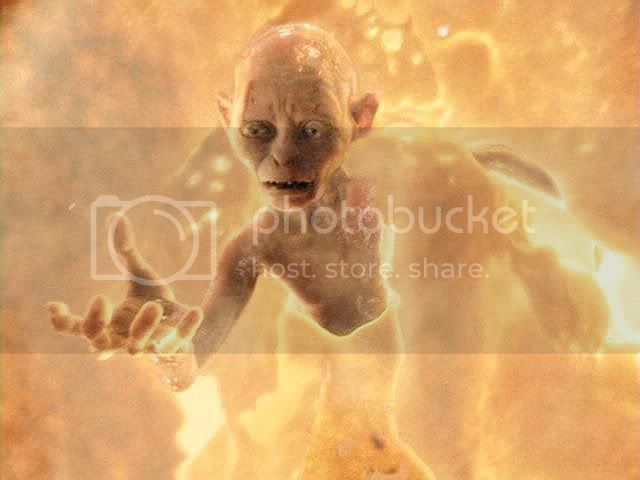 When, in order to save him from Faramir’s archers, Frodo tries to get Gollum to come to him and Gollum won’t, Frodo resorts to threats, threats based on the Ring-oath. 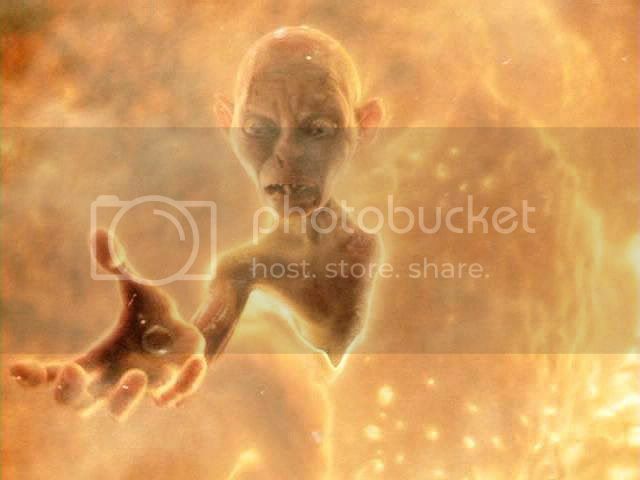 “Precious will be angry,” he says, desperate to persuade Gollum. “I shall take Precious, and I shall say: make him swallow the bones and choke. Never taste fish again. Come, Precious is waiting!” Gollum comes. Later, after Gollum has been captured and taken before Faramir, he is asked on what basis Faramir should accept his word that he will keep the hideout secret. “Master knows,” Gollum answers. “Sméagol promises to Precious, promises faithfully. Never come again, never speak, no never.” I think the reader as well as Faramir is meant to understand Gollum’s promise as a sincere one. The final stage of Gollum twisting his promise is seen on the road to the Morgul Vale. He says to himself, “[W]hen She throws away the bones and empty garments, we shall find it, we shall get it, the Precious, a reward for poor Sméagol who brings nice food. And we’ll save the Precious, as we promised” (my emphases). Thus, what happens at the Sammath Naur, in a sense, is already foredoomed. 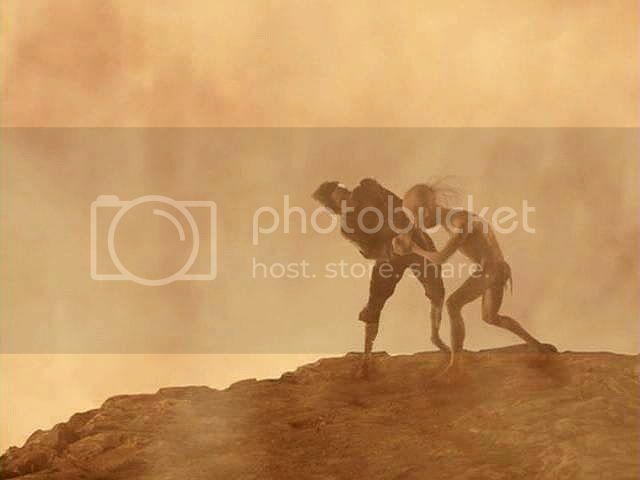 When Gollum goes so far as to arrange the killing of Frodo by Shelob (and then goes through with it), even though Frodo manages to escape from her sting, Gollum has already broken the oath, twisting it to suit his needs, just as Frodo warned he would be tempted to do. 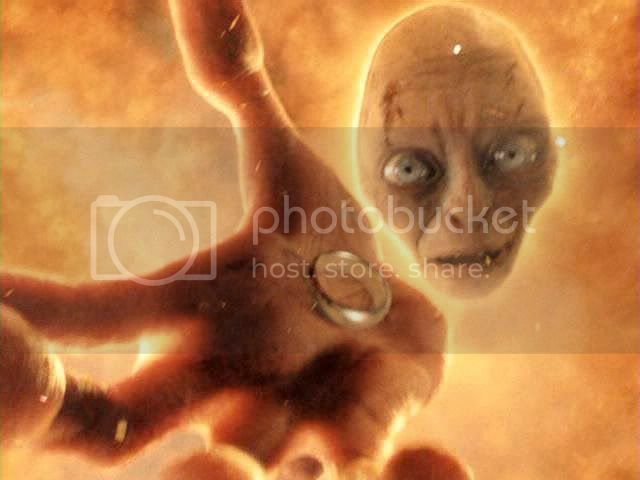 If in Tolkien's world oaths are never broken without consequences—the more dire the oath, the more dire the consequences—then Gollum's fall is not a thing of chance, but something inevitable. 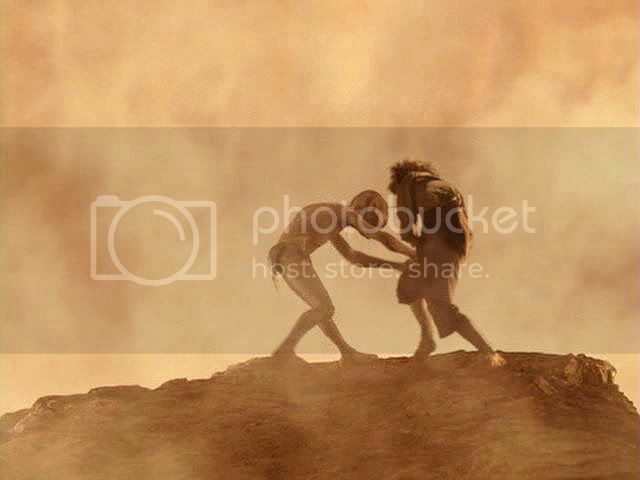 Gollum bit Frodo in the Sammath Naur, wounding Frodo, and, ironically, saving him, body and soul. But Gollum is bitten, too—fatally—not by Frodo but by his own oath. *By “some film scenes”, I mean the scene in Shelob’s Lair in which Gollum attacks Frodo, and the EE version of the scene on the slopes of Mt. 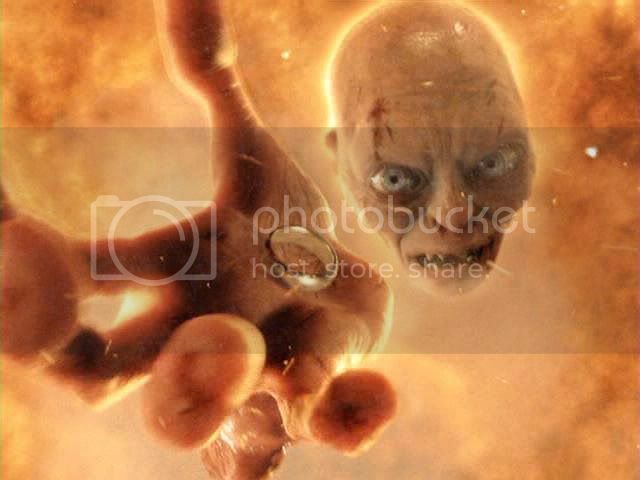 Doom in which Gollum, smirking, tells Frodo his promise was a lie. 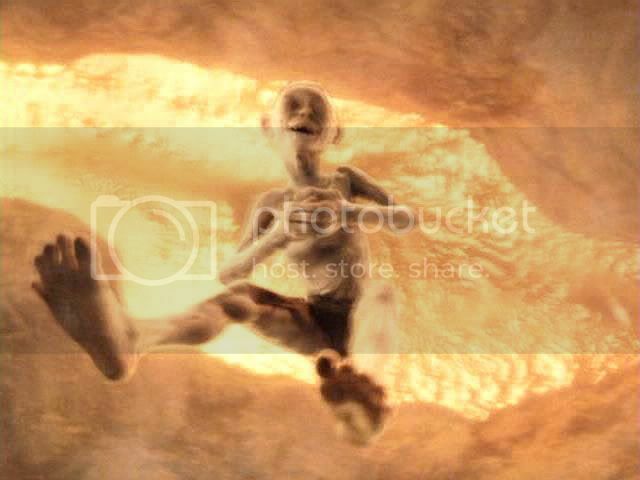 ‘Sméagol promised,’ said the first thought. ‘But the Precious holds the promise,’ the voice of Sméagol objected. (…) [T]his speech abashed and terrified him. He grovelled on the ground and could speak no clear word but nice master. 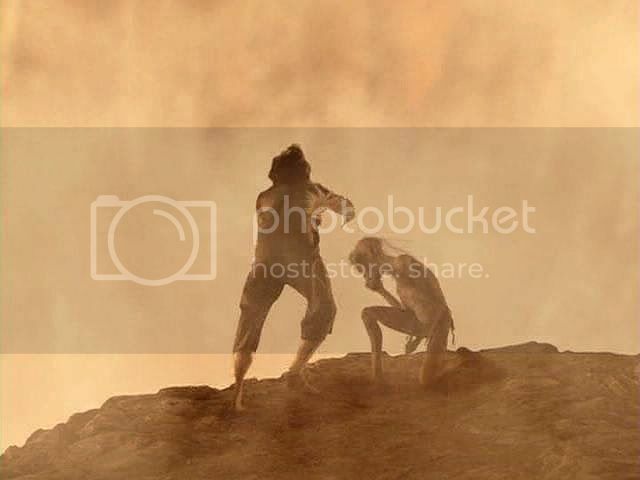 But Gollum was in a pitiable state, and Frodo’s threat had quite unnerved him. It was not easy to get any clear account out of him, amid his mumblings and squeakings, and the frequent interruptions in which he crawled on the floor and begged them both to be kind to ‘poor little Sméagol’. 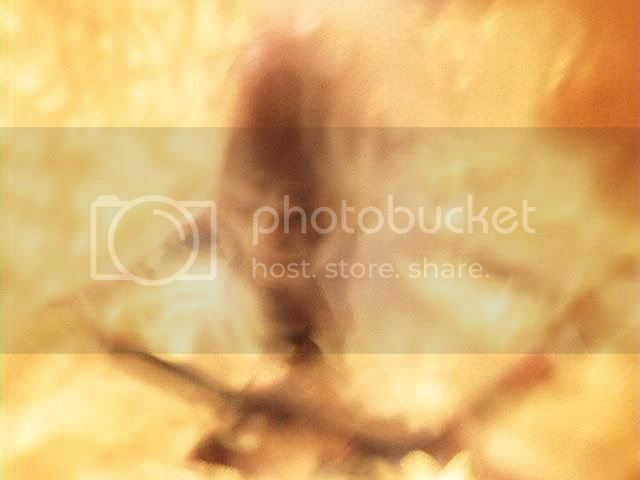 [Shelob] lusted for sweeter meat. And Gollum had brought it to her. Mechtild, I really love this. When I see your cap and essay entries, I long for an entire book of them to browse again and again, to set on my shelf of other favorite books re JRRT. Just a couple of very quick comments as I wait for Elder to arrive for the weekend. It has always seemed to me that the free people are never 'told' what to do, their free will being part of the way M-e is built. Elrond, Gandalf, Bilbo - no one orders another. It is more problematic characters who try to exert their will over others, with Sauron and Morgoth at the extreme end. I'm reading 'Hurin' now, and in the introduction, CT talks about the power of Morgoth's curse upon Hurin's family - the power of those words being backed up by the power of a Valar's self and being. One other quick point (and my goodness, I wish we could linger over a bottle of wine and good cheese, and I could hear more of your perceptive thoughts on LotR!) 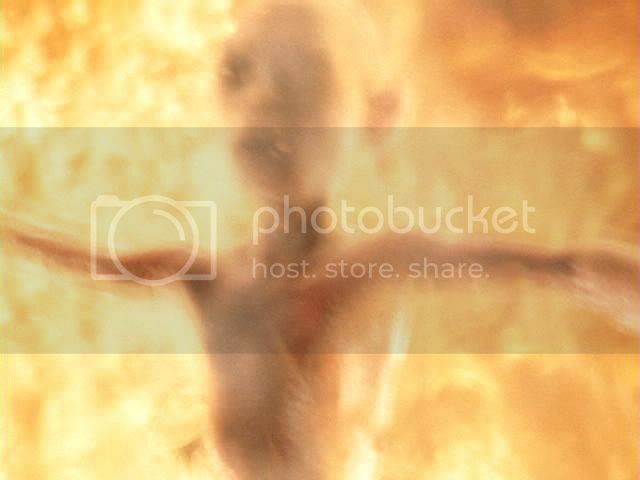 - but in LotR Frodo tells Gollum that he would be cast into the fiery pit (and I don't have time to snag the quote) - and that indeed is what happens. (is that as Frodo is large and white and speaks with the voice of power, the voice of the Ring? Or earlier as Gollum swears...?) But it is another place where words create a reality. (just as JRRT as author is Creator... and so it goes). Thank you so very much for these thoughtful, poetic posts - I really do savor them. Nota, thanks so much for stopping by! Of course I agree on the difference between the charge to the Fellowship that they stay the course "freely", compared to those bound by oath. 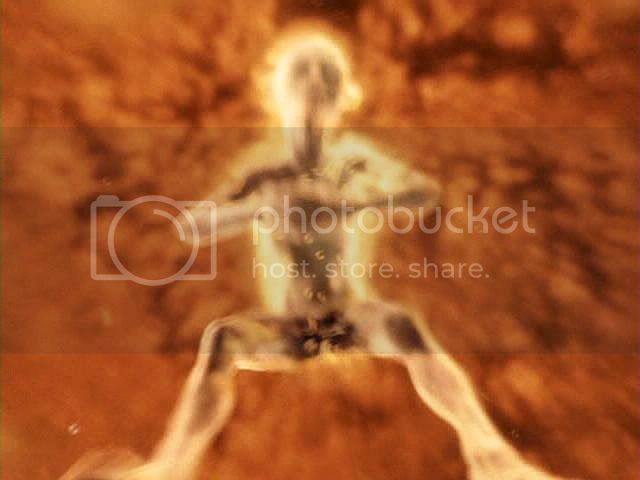 As for the passage in which Frodo tells Gollum how he would command him to leap into a fiery chasm, it's there in the bottom of the post, under "Book excerpts". I think it's the second or third one, but it comes from "The Black Gate is Closed." I agree, by the way, that when Frodo is portrayed as "uber-Frodo", both in the Emyn Muil and far more so on the slopes of Mt. Doom ("a figure robed in white" etc. ), that's the Ring speaking. Wine and cheese...? Sounds goood. P.S. No book is available, but I have tried to make the posts and caps available in an organized way. See the link at the bottom of the pages (or in the sidebar), which takes you to the main page of links. You can choose from there which film you want to browse, in terms of caps and discussions (bearing in mind that I didn't begin discussing that much until a year ago). 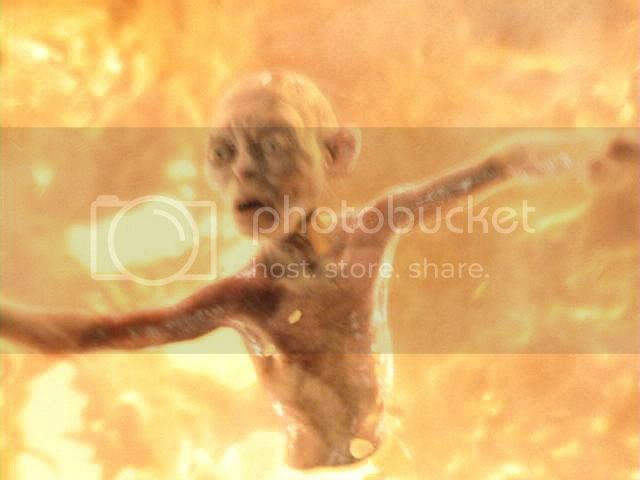 When I look at Gollum's face in this sequence I can’t help feeling pity for him, even love. Wicked as he has been, he is so pitiful, so utterly overwhelmed and outmatched by a power far greater than he, in a doomed contest, his end is a terrible one. And what an extraordinary sequence of images that is. In my own vulture, promise-breaking is so pervasive promise-breaking largely goes unremarked. Wow, I love what you say about Elrond. That had never occurred to me before, but goodness, you are so right. And with all that Elrond has seen, so much bitter history ... he is so wise, to bond the Fellowship through love and not compulsion! Keeping one's oath is a deeply biblical thing to do, of course, and breaking it is not just dishonourable, it is a violation of the soul. Oh, thank you, Pearl, for stopping by. I swear this is my last huge LotR essay. 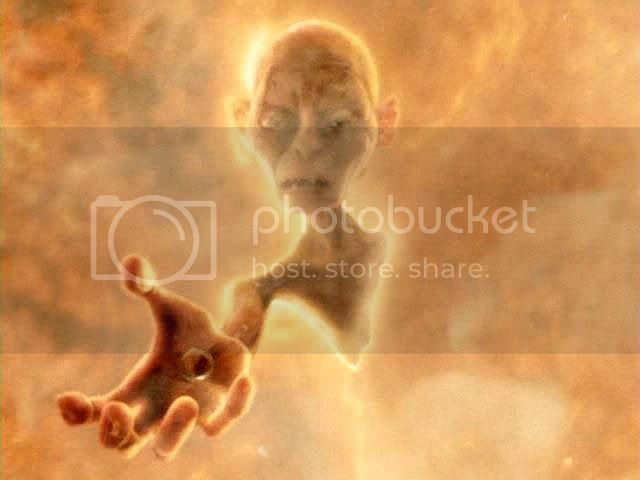 I just hadn't put this much thought into Gollum's oath before, although I had been thinking over the use of "The Word" in LotR and Tolkien's world since coming into the fandom--maybe since participating in TORc's "M00bies reads the b00ks", which really spurred me to think far more deeply about the details of the text, recurring motifs, etc. But the writers there were so tremendous (*sighs nostalgically*). I had written that about Elrond perhaps by coming from a re-reading of the Sil and The Children of Hurin. What a growing-up he had! One forgets, he is already so much older, two ages older, by the time LotR starts. Ah, me too, me too. The three of them all are *brilliant* in that scene. Brilliant. Thanks again, so much, to you and to Flourish (of K-D), who whole-heartedly urged me to listen to the BBC production, and, perhaps as importantly, to give the production a second listen. Not that there still aren't vast areas in it of "Ho-hum" or actual "WTF? ", but the gems in it are as brilliant and true as the light of the Two Trees. Not that there still aren't vast areas in it of "Ho-hum" or actual "WTF?" There are far more "WTF?" moments for me in PJ's LotR, but, as you say, the gems in those films are as brilliant and true as the light of the Two Trees. That project was truly blessed by Providence! Hi, Pearl. I had to dash to work and am now taking a short peek at the mail during my break. The ho-hum for me were the battles like the Pelennor (not terrible, but the device of having a minstrel sing the story did not work for me at all). I thought, by way of contrast, Rob Inglis just plain reading the battle scenes (book on disc) very moving and rousing. I also found the performances for Eowyn and Aragorn ho-hum. King Theoden I found more interesting, the actor possessed of a great voice, but whose performance was a little too "high", bordering on the comic, I thought. In the "WTF"? category--by which I meant, "Why did they do THAT? ", is the casting of Arwen, whose voice is so wrong for the role, and the singing Eagles: laughable, but really terrible, making a good book moment into a joke. I've already said I didn't care for the portrayal of Boromir, but that wasn't because I thought the actor was unskilled, or might have done better with different direction. The rest is good to out-of-this-world. I wouldn't be surprised if the day comes when I listen to my BBC LotR more often than I watch the films. 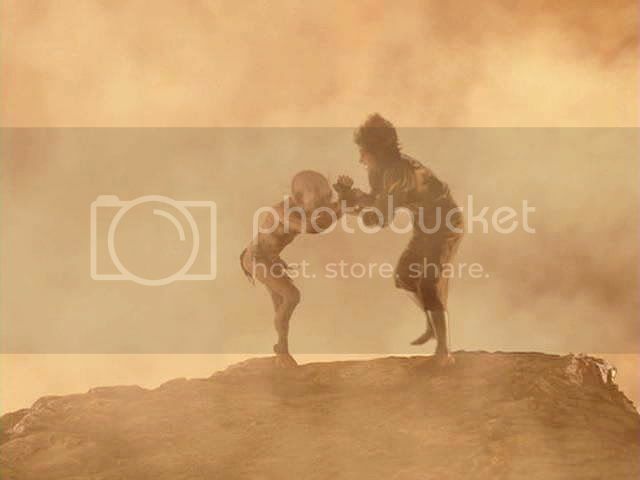 That's likely why the scene is played as it is in the movie, because PJ and the other writers knew most viewers would feel cheated if Gollum slipped and fell, without a struggle with Frodo to explain it. You know, Mews, that's excellent. I confess I haven't the confidence in the film writers to think they knew this consciously, considering some of the scenarios they *almost* filmed, but their subconsciouses must have told them this was the way to go. It's true. The struggle between the two at the brink makes much more plausible--and "right"--that slip and fall into the chasm. 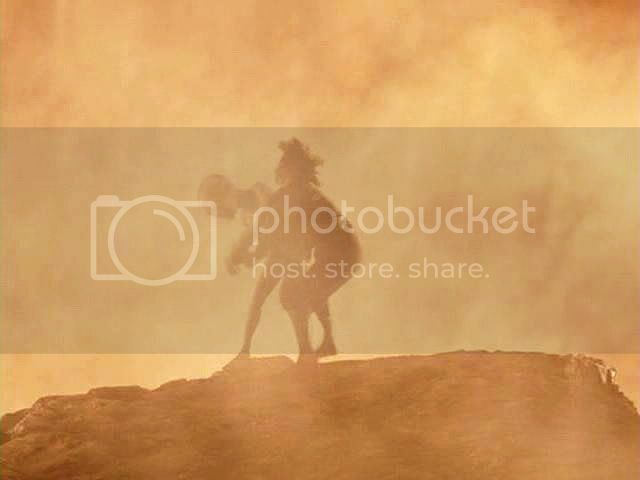 The surprise, for first-time, book-virgin viewers, is that Frodo didn't go into the lava too. I appreciate you comment a lot, Mews. What an essay! I have to think about it and will come back to it. As I said - you can't escape, LOL. LOL! I'm not that quick, I'm a dial-up-er, LOL. That means, first safe everything - go off-line - then translate everything (still off-line), prepare your comment (I don't have to mention I'm off-line?) and then - here we go ... tatata. Today there's massive time for the beautiful things I love so much *hugs you and your posts* and I won't waste a single minute. Of course - it's a Frodo!!! Word to this! Looking at his face – in his eyes, there’s sadness, astonishment, fear … I can’t hate him should he have been bad and wicked. He’s a real Elven King, isn’t he? I think he knows how hard the journey will become and only love could bind them to another. About the breaking of the oaths – mews said it perfectly. There is nothing I could add to this wonderful comment. Thank you, my dear, for this wonderful art of work, for your thoughts – leaving me thoughtful again. It is said “The book to read is not the one which thinks for you, but the one which makes you think.” – This quote is perfect for your essays, mechtild. I am sure this is true. I'm so glad Jan-u-wine helped drive the idea home for me in our conversations. It's been terrific having her for a conversation partner while I'm working on these things. Thanks again for your comments, Julchen. They enrich the posts.